I blew a radiator hose in front of Lefty’s, downtown, so I had to get towed in again, which cost me an hour. Naturally the night had been slow, leaving me without a call for nearly 2 hours, when I called for help. As soon as I called the dispatcher, the phones started ringing, and calls went out, while I helplessly waited. Once I got a new cab, it was dead again, as I simmered, top down on Amtrack. I got a call for McDonald’s on Ricky and picked up a dark skinned man in his early 30’s who looked like he was from India. He spoke perfect English, so it was obvious that he was either born in the US or arrived at an early age. He wanted to go to an address in the shallow South, but first wanted to stop at Bob’s adult book store on State. When we arrived the meter was at $5.50, and he asked me to wait for him, until he came out, as he handed me a $20.00 bill for up front money. Anytime someone asks you to wait for them, if it’s going to be longer than a few minutes you get up front money, so you don’t get burned, or complaints about the amount. At $40.00 an hour waiting time, the meter was at $33.00 when he finally came out and told me that he was going to pay me and stay there longer. “What’s your number?” He asked, “I’ll call you when I’m done. I gave him my card, and ended up with another call for the “Silver Dollar,” where I was supposed to pick up a female named Sandy. After I asked the bartender, I found out that Sandy was on one of the video poker machines, so I walked up to her and told her that I would be waiting outside. She had over $15.00 left to lose in the machine, so she asked me if I would wait. After a couple of minutes I started the meter, and by the time that she finally came out, it had increased $5.00 from the initial $2.70 flag drop. I didn’t waste my breath by asking what she tells her boss, when he asks her to punch out and work for free. I bit my tongue and drove her to the destination that she gave me, in between insults. Her house was only a few blocks away, and she complained about my starting the meter while I was waiting for her, all the way to her house, so the total fare came to $9.90, instead of the normal $5.00, when we pulled into her driveway. She pulled out a wad of $20.00’s, $10.00’s and $5.00’s, and finally gave me a $20.00 bill and told me to keep the change, as she drunkenly stumbled out of the cab. About two hours from the time that I left the guy off at Bob’s Adult Books, I got a call to pick him up. When I got I had to go inside and ask one of the clerks behind the counter where he was. One of them said that he would tell him that I was there, and he walked off to get him, as I got back in my cab and waited. My passenger came out in a couple of minutes and, since I already had his address I just confirmed that we were still going there. Just as I was putting my cab in drive, a tall man, with dishwater blonde hair, in a flowered shirt came out of the building. 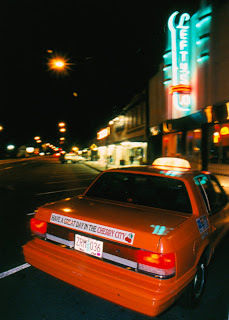 He looked to be around 40 and motioned from the side of the cab, where he was walking. My passenger told me to stop, so I put the cab in park, with the meter still at the $2.70 flag drop. He got out and talked to the man in the flowered shirt, and then came back and told me that he wouldn’t be needing a cab now, as he handed me $3.00 and apologized for wasting my time. “What did you say?” My passenger asked in an irritated tone of voice, that reflected the same kind of hostility that I would encounter if I insulted him. “Okay,” I said as he got out of the cab. The next night I picked him up again at the same place and drove him home, but he didn’t seem to remember me, and when I got him there he paid me with no tip included.